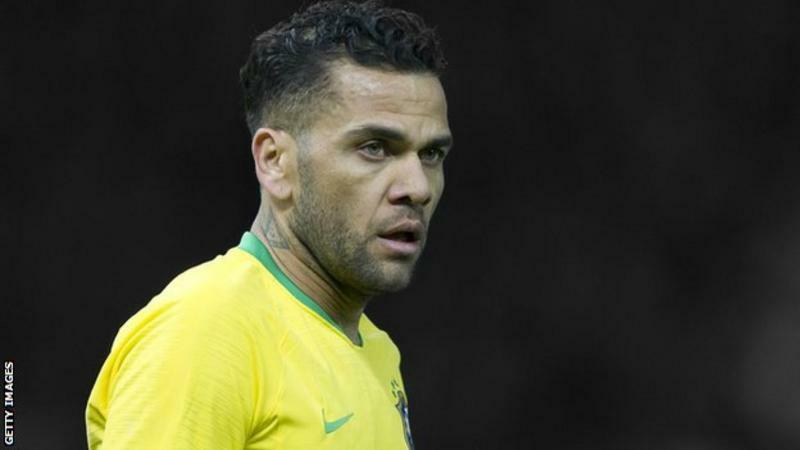 Dani Alves has won titles in Spain, France and Italy"Athletes are often defined by what we do on the pitch, but there's so much more to us. "Dani Alves was one of the best defenders in the world and his achievements are well documented. A three-time Champions League winner, who has won league titles in three countries with Barcelona, Juventus and current club Paris St-Germain, plus 107 caps for Brazil.In his 17 years as a professional footballer, Alves says he never really felt he could tell his life story, the one beyond the public image, until he took matters into his own hands. He is one of more than 2,000 athletes to contribute to the The Players' Tribune (TPT) website.You may have seen Romelu Lukaku and Raheem Sterling do the same during the World Cup. They addressed controversies in their life, hit back at critics and gave raw, honest accounts of their upbringings.The articles helped change some of the public's perception and attitude towards them.It's a new form of journalism that is becoming more and more prevalent, from social media posts and retirement announcements to Manchester City's 'All or Nothing' documentary. Players are "taking control" of the narrative. Sterling has been criticised for his performances for England and off-field issues"It is as if you have dropped in on a conversation", says TPT's New York-based executive editor Sean Conboy. "How they would talk with their friends or family. "Written in the first person and in their own words, including their mannerisms and colloquialisms - each article is sealed with the player's signature.Athletes are treated like writers and are involved in the whole editorial process, right up until publication and Conboy dismisses the notion that the articles are ghost written. They are a collaboration and athletes need to be contactable at all times as they take a "considerable amount of time".Alves has written two articles. His first, called The Secret,[/i] told his life story and he contacted TPT about it. The second, From My Soul,[/i] covered the knee injury that ended his World Cup hopes in Russia and allowed him to "get a message" to his Brazilian fans. "I was very involved, from the very beginning, till the moment we published," Alves told BBC Sport. "My editor came to where I was playing at the time, in Turin. We spent hours together, talking about my life and this piece. We were in constant contact throughout the entire process, right up until we published. "Not until I knew it was perfect did we post. It was a great process, even cathartic for me. A piece I am very proud of. "TPT contacted Sterling for his story, but in America some athletes have pitched their own stories and essays, while NFL and NBA stars have announced big transfers on the site. Some athletes are so invested in the process they are constantly jumping into the shared Google document to make changes and alterations.Conboy flew over to Manchester and spent hours working with Sterling before the 23-year-old England forward left for the World Cup.Sterling wanted his story to inspire children from a similar background and the player worked with an editor all the way up to the publication date.He addressed criticism of his lifestyle and the media "picking on him" because of a perceived love of "bling". It came after criticism of a gun tattoo, purchasing clothes at high-street chain Primark, and even for buying his mother a house.Sterling also opened up about his father's murder and life growing up in London with his mother and sister. "You just stay out of the way and listen, let them talk through their life experiences," says Conboy. "We do not want this to be something polished, but be raw. ""These are not made-up stories, not fluff or to sell something," says TPT chief executive Jeff Levick. "Sterling was not PR, that was his story. It is hard to argue when someone puts themselves out there, lets people see their own trials and adversities." Why do they write them[/IMG][/i] with a poem on the site.Alves is an ambassador, as is Barcelona defender Gerard Pique, who has helped grow the business in Europe.One reason Alves decided to publish his stories was the chance to show a side to him that fans don't see on the pitch. "My life story, growing up, had never been told, not in my words," he continued. "Fans are limited to what they consume from traditional media or social media - I wanted to go deeper and take fans on my journey. "As footballers, we are more than just athletes. We are people, we have families, we have stories, we come from somewhere. It's being able to show that side. It's about what you don't see on the pitch, or hear in a news conference. "Levick says the site removes the "intermediary" between fans and an athlete and lets them speak in an "unfiltered way, telling the stories they want to tell".Conboy adds: "You find they go through so many things in life you can't capture on Wikipedia or Twitter. "We are trying to provide a level of empathy and curiosity about their superheroes, for them to be seen as human beings and not just the guy you see on TV. There are only so many things they can say about football. "Another reason Alves got involved was "control and trust". "I was able to be completely honest, to be myself and not worry about anything being taken out of context," he adds. "It's a nice change when you can control the story and make sure the truth and facts are actually what people will read. "Conboy expands further, saying the players find it a "safe environment" to tell their story. "For some of these players, English is not their first language," he says. "It is their second or third language and they feel vulnerable and worried their words will be taken out of context. ""What we do is help the athlete not let the press control their persona," adds Levick. "We remove the click-bait headlines and spin." But Conboy says it complements traditional media rather than replaces it and is "authentic storytelling", while Alves says journalists are "important to the game of football". "Sometimes you want to speak directly to your fans, versus telling your story through a third party," he adds. "We speak to the media every day, too, so it's not like TPT is a replacement for that. But it's a great platform because it allows us the freedom to be transparent and to not let the message be taken in a way that wasn't intended. ""When the stories come out they are genuinely happy," concludes Conboy. "They feel they have made a connection and created something their kids or grandkids will read."